The complaints have been going back and forth. The South Korean manufacturer of LG washing machines said that U.S. tariffs were violating WTO (World Trade Organization) rules. The U.S. has said that LG machines were unfairly cheap because they were subsidized by the Korean government. In world trade terms, the South Koreans were “dumping.” The U.S. responded with tariffs that elevated the prices of the LG machines. Although we’ve looked at the story (here and here), it’s time for an update. It’s been 16 years since a President resorted to a 1974 law that “safeguarded” industries from an import threat. The 44 year-old legislation said protective tariffs were okay if the USITC (United States International Trade Commission ) concluded domestic firms were being harmed by imports. Now President Trump has gotten the go ahead from the Trade Commission. In addition, his trade advisors have confirmed that LG machines have whittled down Whirlpool’s sales. So this week, he announced that new tariffs will start at 20% for the first 1.2 million imported washing machines (not just LG) and to 50% for any more. Then, during years two and three, the tariffs will diminish. Tariffs create new incentives on the supply and demand sides of markets. The tariffs surely gave LG the nudge to build its first plant in the U.S. Located in Tennessee, a new one million square foot LG plant will be able to produce a washing machine every 10 seconds. But we have to wait until it opens during the first quarter of 2019. 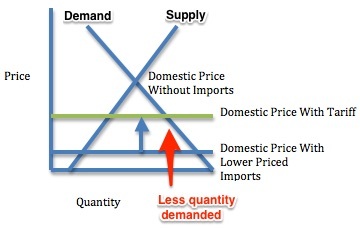 On the demand side, tariffs decrease the quantity of imports that consumers are willing and able to buy. The reason is the law of demand. When price goes up, quantity demanded goes down. Where are we? Let’s end with my basement. Several years ago, to get a better machine, I switched from Whirlpool to LG. Consumers like me would benefit if Whirlpool decided to compete through innovation rather than tariffs. My sources and more: Including Reuters and the NY Times, all of the major media have covered the new washing machine tariffs. Less prominent, this article tells of LG’s new U.S. plant. And here, you can read the 1974 safeguard provisions.